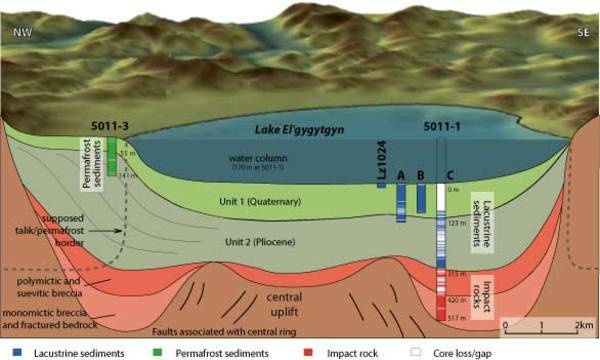 Schematic cross-section of the El'gygytgyn basin stratigraphy showing the locations of ICDP Sites 5011-1 and 5011-3. At Site 5011-1, three holes (1A, 1B, and 1C) were drilled to replicate the Quaternary sections. Hole 1C further penetrated the remaining lacustrine sequence and then 200 m into the impact rock sequence. Lz1024 is a 16-m-long pilot core taken in 2003 that overlaps between the lake sediment surface and the beginning of the drill cores 1A and 1B at Site 5011-1.